Amber joined the Synergy Financial Group (SFG) team as a Wealth Advisor Assistant. She serves as the relationship manager for the clients of SFG’s founding partners, Larry Leitch & Steve Spurrier. She also assists the Director of Financial Institutions with mergers and acquisitions. 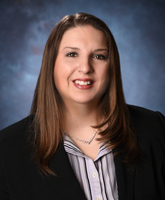 Earlier in her career, Amber served as an administrative assistant and became insurance and investment licensed to grow a practice as an advisor. Her line of work broadened as she worked with wealth management clients and plan sponsors and their retirement plans. She has held positions also as a Financial Advisor, Retirement Plan Senior Account Executive, Planning & Investment Specialist, and Client Service Associate. Amber and her husband, Rob, live in Halethorpe with their two sons, Bobby & Nathan, and their daughter, Lily. Whether it’s family game night, or attending youth league sports, Amber enjoys spending quality time with her family.